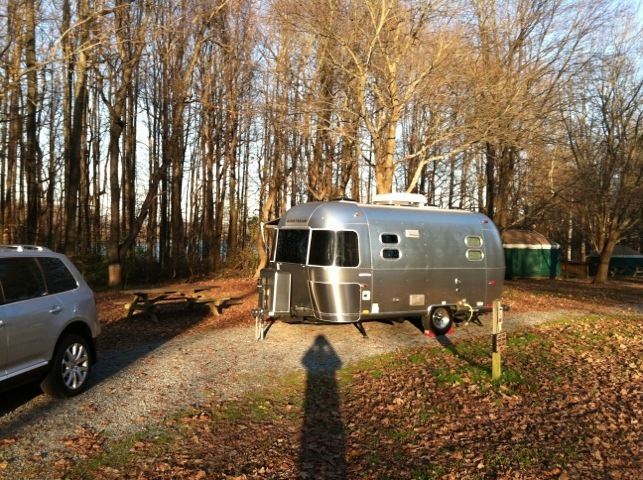 I had to drag the Airstream to the DMV anyway for title, tags and registration, so why not camp on this beautiful weekend at Lums Pond – 30 minutes from home. Nutcrackers start next week, and I’m still recovering from PRK eye surgery, so could not play my scheduled “Messiah” performances this weekend (too many little notes and night. 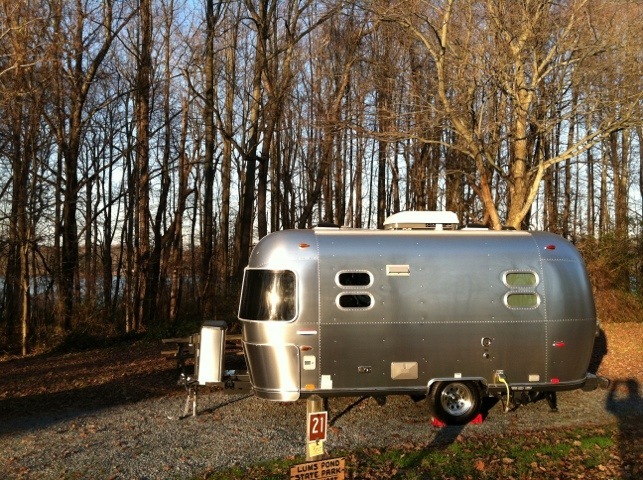 First off, we need to come up with a name for our 19ft Airstream Bambi. After seeing it parked in the driveway like an alien spacecraft (esp. with the antenna cranked up), I think we may have settled on “Apollo 18”. It took us nearly an hour to rig a way to back it up our mal-formed, deeply-guttered driveway. Since DelDOT has since repaved the gutter, the journey out took a few minutes (and I did it alone!). Off to the DMV. Lost a tow-mirror on 495. Titled, tagged, and got the vision restriction taken off my license, just 10 days after surgery. Quick stop at Glenn’s mom’s place for a tour, then off to Lums Pond. Lums Pond is just about the only campground open year-round in the area. Oddly – virtually empty. Clean, and quiet. Except for the swarms of migratory birds at dawn and dusk. Makes Hitchcock’s “The Birds” seem like an aviary lite day. The sound of 10,000 birds in flight, landing in trees, is impressive. Especially the half-second of quiet when they all think at the same time before taking off. Glenn came over after his rehearsal and I had baked lasagna, Texas toast, and apple pie waiting. It’s so great having an oven in the trailer. And camping is so much better post-PRK. I got into bed last night, turned out the light, and put my head on the pillow. Looking up through the window over the bed, I could see stars – the Big Dipper. Stars… I have never seen stars from bed. It actually made me tear up. And at my campground shower this morning, I didn’t need to hook my glasses on the shower rings (cuz the always fall) or find a place on the bench where I won’t sit on them. It’s the little things. Then I went back to have breakfast and my morning coffee. 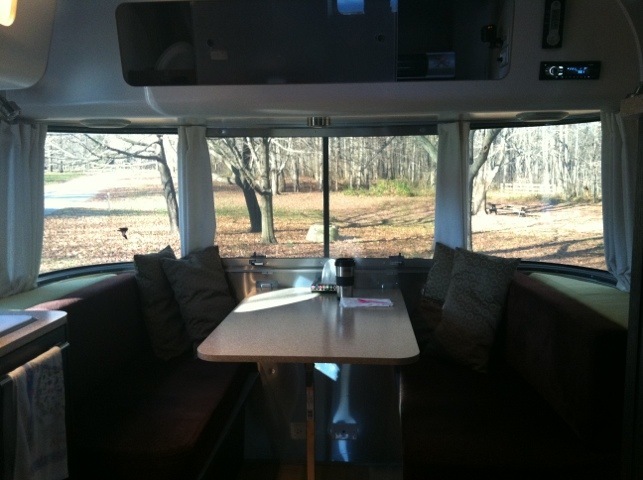 Apollo 18 has been winterized, so I can’t use the sinks, shower, or bathroom. But I can bring water to cook with, and bake, and the fridge/freezer work great. I might just camp in Jersey City this January when I next play with the New Jersey Symphony. Looking forward to years of travel adventures in the lunar module. That’s a sweet set up! 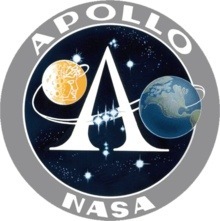 Do you know anyone who could customize your ride by painting the NASA logo on the side? Wow, what an amazing rig. How does it compare to the previous T@B? What happened to the T@B? 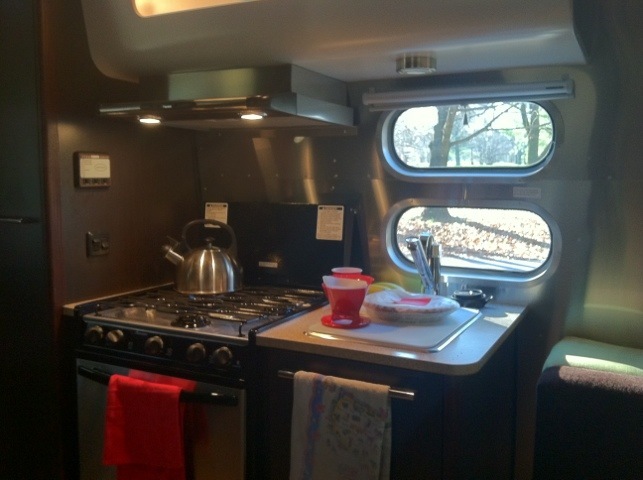 The stove looks amazing in the Apollo 18. Can you post more pictures of it?